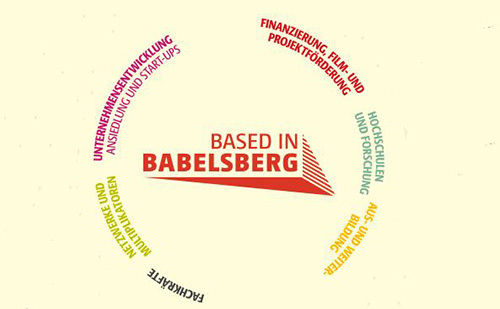 Mit mehr als 120 Unternehmen und Institutionen ist Babelsberg das Innovationszentrum der europäischen Film- und Fernsehwirtschaft. Nirgendwo sonst sind so viele Top-Spezialisten der gesamten Medienproduktion so nahe beieinander – und so gut miteinander vernetzt. Hier kommt Bewegung in Ihre Idee! In Babelsberg sind Film- und Fernsehstudios, IT-Unternehmen, TV-Sender, Radiostationen Tonstudios, Games-Entwickler, Produktionsfirmen und Spezialdienstleister mit über 3.500 Mitarbeitern zu Hause. Aber auch exzellente Ausbildungsangebote, aus denen international begehrte Fachkräfte hervorgehen. Auf 46 Hektar finden Sie alles, was Ihr Projekt braucht – viel Herzblut inklusive. Rund um die Medienstadt Babelsberg finden sich zahlreiche Institutionen, die bei der Unternehmensentwicklung, Projektförderung, Suche nach Fachkräften oder Netzwerkanbindung weiterhelfen können. Der One-Pager "Institutionen rund um den Medienstandort" bietet schnell und unkompliziert einen Überblick dazu. Hier steht er zum Download bereit. The FILM TECH APP is available now! For the first time in german speaking countries there is an app which presents clearly, understandably and from a single source technologies for the production of film and television. The app was developed by transfer media production services GmbH. An intuitive search on the front page provides targeted results proofreading by professionals from practice. The contents are updated every 3 month So: Download, sniff and then unlock all content for 8,99 Euro once. A new definition of "big:" Big Image has introduced the world's largest printer at its location in Babelsberg. The Infinitus makes prints of up to 12 x 50 meters possible: for filmsets, stage sets, trade show banners, and backdrops. The production halls of Big Image combine both a showroom and a fully-equipped atelier. It even offers a visitors' gallery with a view of the backdrop that hangs on a 20-meter-long rail, theatre-style. For the first time, XXL prints can be spread out on a 40-meter-long surface, worked on, and divided up as clients require. Serious Games Solutions at Babelsberg received the Digital Communication Award for the development of Siemens Power Matrix Games in September 2013. With their successful browser game about environmentally-friendly energy generation, Serious Games Solutions has won out against high quality competitors. The prestigious award is presented once a year. In March 2013 at Studio Babelsberg shooting began for "The Monuments Men" with George Clooney as producer and lead actor. The film is scheduled for release in December 2013. The script of the action thriller was written by George Clooney and Grant Heslov and is based on the novel of the same name by Robert M. Edsel and Bret Witter. Clooney and Heslov are producing the movie together with their company, Smokehouse Productions. It is their first production since their film ARGO won the Academy Award for Best Picture. "The Monuments Men" is a co-production with Siebente Babelsberg Film GmbH, a subsidiary of Studio Babelsberg AG. Barbara A. Hall is the executive producerfor "The Monuments Men." Charlie Woebcken, Christoph Fisser and Henning Molfenter are co-producers. Sony Pictures will release the film for US cinema, while Twentieth Century Fox will handle international distribution. The all-star cast includes George Clooney, Matt Damon, Bill Murray, Cate Blanchett, Jean Dujardin, Bob Balaban, Hugh Bonneville, and John Goodman. "The Monuments Men" is based on the true story of the greatest treasure hunt in history. US President Roosevelt sent a special Allied military force to Hitler's Germany to rescue artistic masterpieces from the Nazi regime who threatened to destroy this cultural wealth late in the Second World War. These motley group of museum directors and art historians were more familiar with Michelangelo than assault weapons. How could they possibly have hoped to succeed in getting behind enemy lines? In a race against time, the Monuments Men risked their lives to avoid the destruction of centuries-old culture. George Clooney's top-class team includes the cameraman Phedon Papmichael, Oscar®-nominated production designer Jim Bissell, the Oscar®-winning editor Stephan Mirrione, costume designer Louise Frogley, and the five-time Oscar® nominee, composer Alexandre Desplat.